Every guitar player can reach a point in his career where they want to add something extra to their sound, if you don’t know how, here we have listed some of the finest pedals you can find on the market, all applying the very popular and classic Overdrive effect. What Makes A Good Overdrive Pedal? How Practical Are Overdrive Pedals? Many of the best overdrive pedals are often thought of as being truly revolutionary and have remained on the shelves for decades since they were first introduced, and justifiably so, you might just discover the missing link in your setup after acquiring an overdrive pedal, it’ll take your sound to the next level, regardless of what genre you prefer, Classic Rock, Blues etc. Let’s not waste any more time, it’s up to you to take your pick after the deciding the specifics attuned to your liking. Enjoy! Timeless overdrive with a great tone and a very user friendly design. Loads of low end power in a simple pedal that just delivers. Pretty unique design that combines two different overdrives for ultimate tone control. On-point reproduction of vintage overdrive effect with impressive amount of tone control. Distinct boutique overdrive with a good amount of Tube Screamer mixed in. Well built and designed overdrive that's among the most popular models today. Decent performance that comes with a budget-friendly price tag and great features. Among the most prolific overdrive pedals made popular by its solid performance. Depending who you ask, some guitar players will tell you that Boss made a name for themselves by supplying the world with affordable overdrive pedals that just work. There’s a lot of truth in this statement and SD-1 is a perfect example why. It’s one of the most basic pedals in terms of controls and features, it’s affordable, and it brings on the thunder in ways which will make you grin involuntarily. That’s about as much as you can expect from an effects pedal. SD-1 was first designed over two decades ago, yet it still holds its ground as one of the go-to choices on today’s market. Overdrive it offers is balanced, a bit chaotic but still within the limits of taste. It’s a Marshall Plexi in a box. If you need a standard, reliable overdrive and you are working on a tight budget, Boss SD-1 is one of the best choices you have. Whether you use it with a clean or overdrive channel, the quality is still there. MojoMojo by TC Electronics is definitely among the more interesting overdrive pedals you can get in the affordable range. It comes in a sturdy enclosure and features a lot more than the bare bone design you would expect. Frankly, we are surprised that TCE didn’t include their trademark TonePrint technology in this package. However, it’s perfectly fine the way it is. You have your standard two band EQ to work with, along with level and Drive controls. Right in the middle of all these knobs, you’ll see a Voice switch. What this does is impact the mid frequencies, allowing you to be sharper or more loose in that part of the range. While it’s definitely a neutral overdrive, the versatility it offers is worthy of respect. With some imagination, you can dial in a whole range of tones using just this pedal alone. Add a true bypass into the mix, and you have a formidable stompbox built for the masses. That’s the type of policy we can stand behind. One thing that you have to appreciate about Wampler is their eagerness to reach out to talented musicians and cooperate with them to design new pedals. Their Dual Fusion overdrive is the fruit of one such effort. The pedal itself is pretty complex for an overdrive, but that is mostly because it’s a 2 in 1 type of deal. If you look closely, you will see that there are actually two clusters of controls mirrored don each side of the pedal. One side is labeled as Modern while the other is leaning more towards the vintage type of tone. Needless to say, the fusion of these two sounds is amazing, while the authenticity of tone of each mode is tangible as soon as you crank this bad boy up. So, is the end product worth the investment and the necessary learning curve? We’d say the answer is yes as long as you’re looking for something that transcends tube screamers or similar simple designs. If you’re looking for a specific sound reproduction, reminiscent of the classic British guitar amp’s tones. The Muff’n is a unique provider when it comes to that, a fan-favorite of many, truly one of the best overdrives out there, even if you’re just getting familiar with its sound. Utilizing vacuum tubes in order to do what it does, it mimics the richness and saturation of the iconic British valve sounds. The controls on this pedal feature Low, Mid and High tone modulation, and Volume and Gain modification. This masterpiece offers exactly what it advertises, lush sound enrichment used by the likes of AC/DC, you’ll achieve that exact same tonal output when playing around with the various control settings. 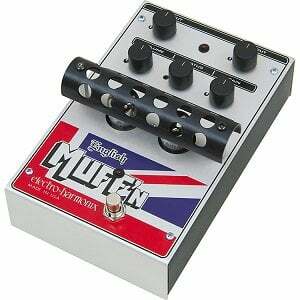 The Muff’n is an immaculate pedal manufactured by EH, targeting fans of specific old-school sounds, it fits in to a standard of its own. Well worth it’s price if you’re on the hunt for something different. When standalone overdrive pedals first appeared, there were several different designs available. One that quickly broke through to the top, and stayed there decades to come, is the Tube Screamer. The company who’s responsible for this awesome pedal is Ibanez, and the first one they’ve released was the legendary TS808 back in the ’70s. Today, you can get the reissue of that same iconic overdrive which has pretty much shaped the world of guitar distortion. Ibanez has decided to bring back the legend while trying to keep the changes at a bare minimum. Knowing that this pedal, in its original or revamped form, has been on pedalboard of many iconic guitar players is all the proof you need of its performance. It’s a simple device with few controls, but the thing just brings on the thunder like no other pedal can. If you want to taste what vintage guitar overdrive is all about, this is the pedal to go for. You will not be disappointed. The name JHS Pedals chose for this pedal is very fitting. Whether they were aware of that or not. Just like the other product we associate with moonshine, this thing brings the core of what overdrive is all about, in a crude and reliable package. When we say crude, it’s actually a compliment. They’ve shamelessly based the whole design around the tube screamer type of overdrive, but they’ve introduced a lot of their own solutions. We need to give credit where credit is due. 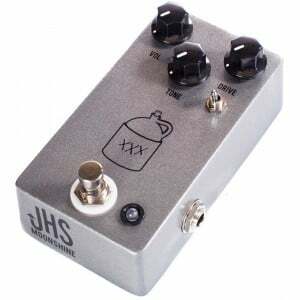 JHS Pedals gave the good old TS a brand new suit, with a bit of a twist, and we like it. The tone is easy to align with your needs, but it’s always going to have that rugged vibe. If you know whatever so slightly abused Plexi sounds like, you will know what we’re talking about. Headroom, clarity, and overall versatility are just some of the things Moonshine brings in abundance. If you’re a fan of TS, you should check this bad boy out. 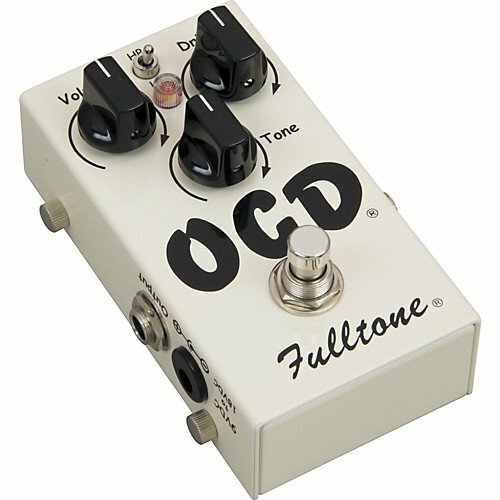 OCD has become one of those overdrive pedals which was living on the margins of the market, only to be yanked into the center of attention in a matter of days. There’s a perfectly good reason for that. Fulltone gauged the market, figured out what the scene needed at the moment, and hit the nail on the head with their OCD series. Obsession is just one in a relatively long list of models from this family, and it’s bringing that same killer overdrive with a pinch of its own character in there somewhere. The first thing that makes the OCD Obsession worth it is the gain transition, and how they’ve solved gain in the first place. There’s an abundance of it, but it’s so easily controllable that it’s scary. You can dial anything from a slight, refined overdrive to a full blown heavy rock vibe. Best thing of all? There’s no impact of transparency of your signal nor its raw color. Fulltone definitely delivered again. Behringer’s ability to strip create a formidable effect pedal, and then strip it down until it’s affordable is not a secret. Their pedals are always going to have a market, and Behringer will probably continue to reward that gratitude by launching even more pedals which are just amazing at their very core. Since overdrives are among the easiest pedals to design, it’s no wonder that Behringer currently offers a very affordable yet very capable model. We are talking about the OD300. This model represents a fusion between overdrive and distortion, and completely blurs out the line where one ends and the other starts. OD300 is easy to use and packs a decent range of tone shaping capabilities. It’s definitely not something you would want to do a world tour with, but for practice or occasional gigging, it is more than fine. Those working musicians who are operating on a super tight budget will appreciate a solution such as this one. Boss overdrive pedals are numerous. We are talking at least two digits worth of different models. With that said, some prove to be better than others over time, and those become instant legends. Whether or not OS-2 belongs on that list is yet to be seen. However, the type of quality, versatility, and functionality this pedal brings to the table definitely makes it outstanding. Especially considering its affordable nature. It’s pretty hard to describe the effect itself. When in overdrive mode, there is enough definition and precision for it to keep up with your requirements, no matter what they are. Once you kick it into distortion mode, things get cranked up to 11. It is absolutely safe to say that Boss OS2 is one of the most transparent and best working Boss overdrive pedals you can come by. Therefore, it is our humble opinion that it’s a perfect piece for those on a tight budget but still prefer to have some does of versatility on their pedalboard. H2 What Exactly Is The Overdrive Effect? Overdrives are a staple of modern electric guitar tone shaping. These pedals are used in just about any genre of music that involves electric guitars and electric bass guitars for that matter. So much so that it’s fair to say overdrives are among the first guitar effects pedals that you should get. Before we go any further into explaining all of the beauties of an average overdrive, lets find out how this effect came to be and where it all began. As most of you probably know, overdrive was first discovered when someone decided to play with tube amps. To be more specific, the sound we associate with overdrives was achieved by pushing amplifier tubes way outside their comfort zones. Once overloaded, they would start to distort sound, thus creating overdrive. This method is still considered to be the best way to get organic overdrive. However, not everyone can or wants to push their amp to such extremes on a daily basis. That is where overdrive pedals come in. Long time ago various manufacturers have found a way to recreate that clipping effect we just talked about and pack it into a pedal format. One common misconception you will hear is that overdrives are the same as distortion pedals. That is simply not true. These two belong to the same category of pedals but they are ultimately very different. As a matter of fact, you could say that fuzz pedals are right in the middle between overdrives and distortions. The next logical question is what is the difference? It all has to do with gain. Overdrive pedals have a very tame amount of gain while distortions offer an abundance. On top of that, latter tends to be much more intrusive. The point is that overdrives won’t give you that chunky high gain distortion. We wanted to clear this up because a lot of new players fall for this trap and end up disappointed. If you would like to learn more about distortion pedals, check out our guide for that effect. The beauty of overdrives is that they don’t need to be complex. On the contrary, simple almost always better. When it comes to what makes a good overdrive, it all comes down to the circuitry inside. Almost every overdrive pedal out there is fashioned after one of the several popular models. For those who are just starting out, you really can’t go wrong with a TS808 Tube Screamer from Ibanez. It is an iconic pedal that has plenty of range and can be tweaked to work with all kinds of music genres. Using an overdrive might seem like a simple enough task. After all, these pedals are about as simple as it gets? Not necessarily. One of the most common ways to use an overdrive is to simply plug it into your signal chain, dial in a value you like and go with that. However, once you start thinking outside the box, you will find that there is so much more to these pedals. Here are the two main scenarios we are going to cover today. First one implies using an overdrive pedal with your amp’s dirty channel while the other one deals with completely replacing your dirty channel with your pedal. The idea behind this method is to sort of boost your amps natural sound by utilizing the additional power of your pedal. We strongly recommend that you dial every knob on the pedal to its lowest value before you start. Without even touching anything else, just start to slowly add volume (or level depending on your specific pedal). You should hear your amp’s overdrive channel start to sound hotter and wider. You can experiment by adding a bit of grit and changing other parameters. One key thing is to take things slow as not to go overboard. With some tube amps, this can even mess up your tubes. In this case, you will want to have your amp set on the clean channel. Turn on the pedal and apply the same steps as we have described above. When dealing with a clean channel, you might have to be more liberal with your volume and overdrive levels as you are building the overdrive tone from the ground up. Pair it with select modulation, such as a good chorus pedal and you have a great platform to work with. Overdrive pedals have found their purpose in just about any genre of music spanning from jazz to heavy rock. The fact that you have the liberty to add a tiny bit of grit or as much gain as the pedal can offer, means that you can do just about anything you want to. Is the pedal itself not enough for you? Simply punch that dirty channel button your amp and you should be good to go. At the end of the day, you can squeeze a lot of performance out of an overdrive pedal. It may take some time to figure out exactly how to tap into that potential, but it is definitely there. Another awesome thing about overdrives is that they don’t have to be expensive at all. Boss has quite a few awesome OD pedals which work more than well, but come at reasonable prices. Expensive models are usually boutique designs which implies sophisticated analog circuitry and a bunch of other niche stuff. We’ve reached the conclusion of the first draft of choices when it comes to your overdrive needs. We covered some vintage masterpieces and heavily modernized pedals rich with variety. Every pedal is equipped with a specific set of qualities, covering the needs of guitarists of all backgrounds. In case you’re left wanting more the list will be subject to change with more additions over time, adapting to the ever improving world of guitar pedals and what they can offer. Great article but the last one is Boss, not Behringer. 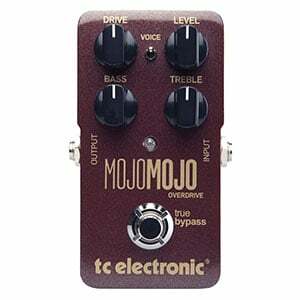 In the review of TC Mojo Drive, you say that you are surprised that the Tone Print feature is not available. I don’t think that is so strange, as it is an analogue pedal, and therefore it is not possible to modify the parameters and ranges digitally via Tone Print.